Dickson and I will be meeting at "The Line" tomorrow at 9 AM for 13 or so easy miles. Come on down and join us, won't you? It's a little dated, but change some of the names around (not Larry) and the general gist of the message is the same. 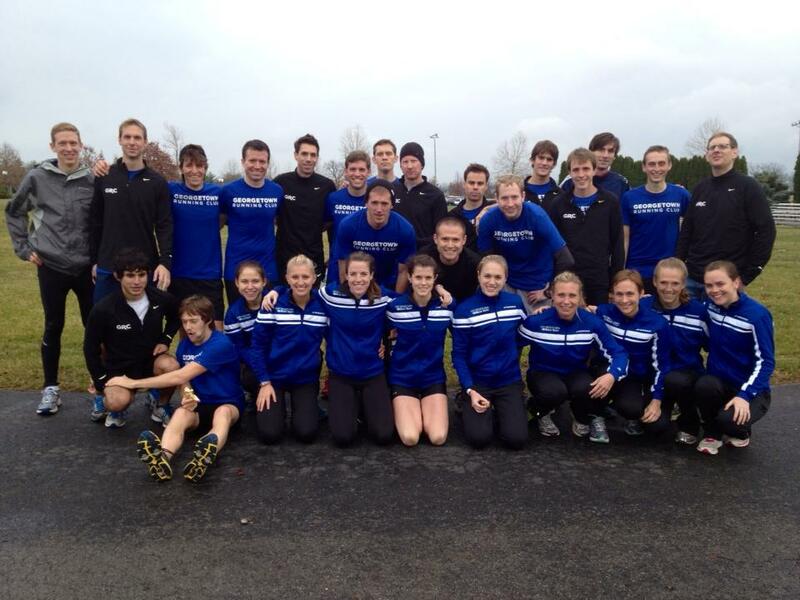 On Sunday night, the Georgetown Running Club announced its annual awards for top performers for 2012. The awards that previously had been known as the "Coach's Award" have now been named the "Lauren Woodall Roady Memorial Award". Coach Jerry has tirelessly guided a team of over 50 individuals throughout the past year, achieving historic team successes on the track, roads, and cross country. Every week Jerry volunteers at the track, whether in the hot August sun or the cold wind and snow of February, catching our splits and listening to us whine. Jerry attends all of our races, and responds to all of our emails while asking for nothing in return. It is for all of this that the GRC Board honored Jerry with it's Most Valuable Member Award, which doesn't even begin to express our gratitude for Jerry's leadership of the team through our darkest moment. The last two weeks have reminded us all just how valuable Jerry is to this team. The indisputable highlight of Sam’s season was his outstanding 29:37 for 10,000 meters at Penn Relays, which shattered his own club record. In what was arguably the greatest performance ever run in a GRC singlet, Sam’s tactics were perfect, as he ran controlled for the first half, and recorded a big negative split in the second half. 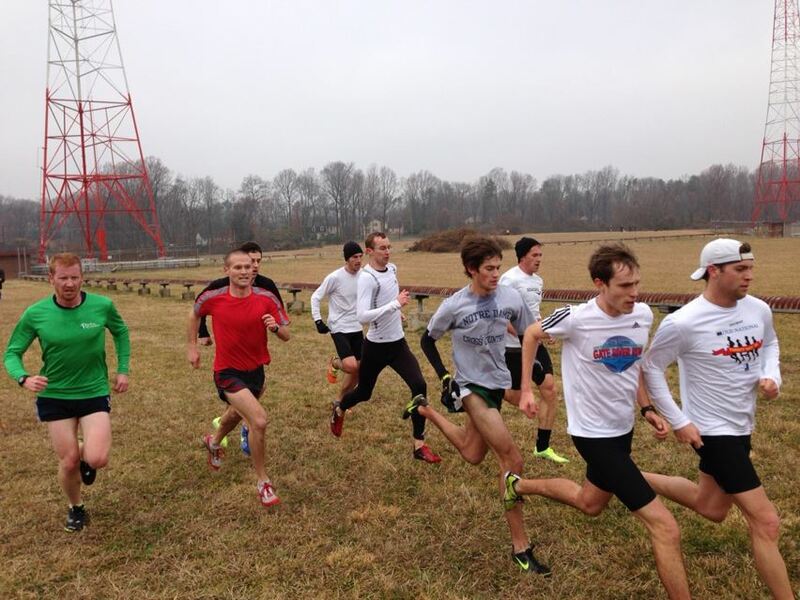 Those tactics will serve Sam well as he looks to run another massive PR at 10,000 this spring. 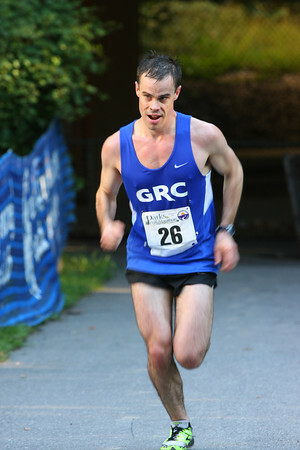 Sam also ran GRC seasonal bests of 8:25 for 3,000 at Towson,14:18 for 5,000 meters at Swarthmore, and 50:51 for 10 miles at Army. 2012 was a breakout year for Drea, who ran major PRs at every distance she raced. Drea started the year by lapping the field in the 5,000 meters at the Maryland Invitational indoors, and she continued to show her opponents no mercy in the spring, running PRs of 35:46 for 10,000 meters at Penn Relays, and 58:50 at Army 10. Those performances are best described as stunning, because her 5,000 PR on January 1 was 17:55, and she ran faster than that pace for 10,000 at Penn, and she had never broken 60 for 10 miles. Drea continued her parade of PRs in the fall, running an outstanding 1:20:08 at the Philadelphia Half Marathon. 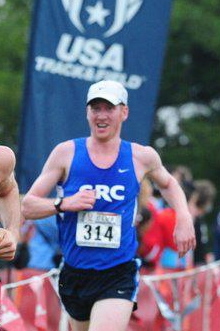 Drea also set the GRC club record for 15k, running 56:51 at the USATF Championships. This spring, when Drea runs her first marathon in a GRC singlet, another huge PR is inevitable. 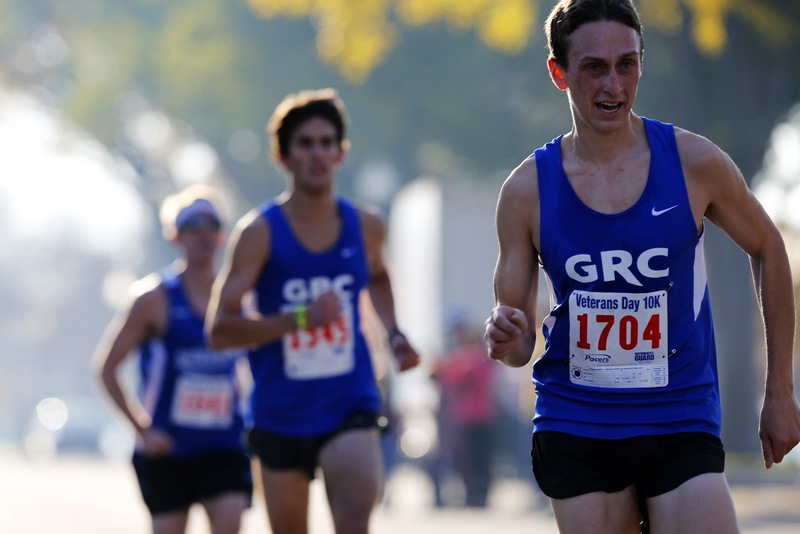 Alex’s college did not sponsor track, and as a result Alex came to GRC with a surplus of talent, but a dearth of experience. Also like Witters, Alex was far and away the top runner on his college team, and was unaccustomed to training with more accomplished teammates. Alex adapted to the new regime quickly, running big PRs of 15:11 for 5k and 32:09 for 10k, and earning a coveted spot on GRC’s A team at Club Cross Country Nationals. As Alex continues to explore his talent, he will be a man to watch in 2013, and beyond. 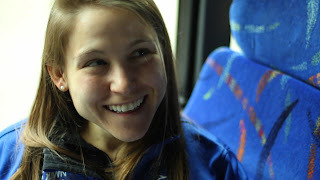 Lauren Woodall Roady started 2012 as an above-average local runner training on her own. She finished 2012 as an elite runner who was an integral part of GRC, and who had the potential to become a national class marathoner. 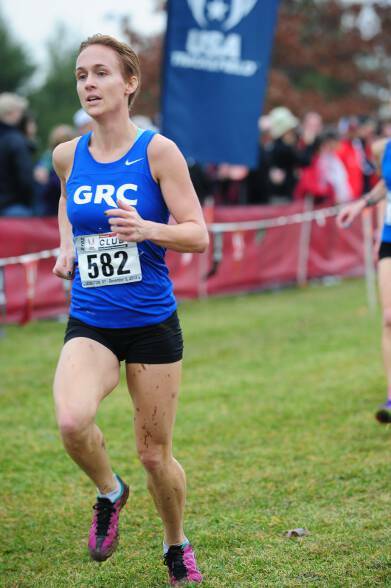 Lauren’s PRs when she joined GRC in March were 18:55 for 5k, 41:46 for 10k, and 1:28:30 for the half marathon. In less than nine months, Lauren dropped those PRs to 17:53, 36:35, and 1:21:41. Lauren set such a high bar for herself that after each of those breakthrough performances, she was disappointed that she didn’t push herself harder, as she felt that she had more left within herself to give. 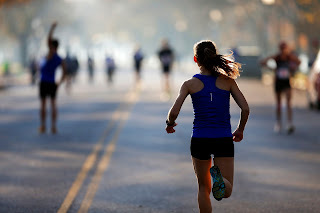 Lauren’s best event would have been the marathon, and her training for Phoenix was going so well that she had a legitimate chance to knock more than 20 minutes off her PR of 3:12:48, and she surely would have continued to improve from there. Lauren’s indomitable spirit and tenacity will serve as an inspiration to all GRC runners, and from now on we will race with Lauren’s initials on our singlets, so that her memory is close to our hearts, both literally and figuratively. Jake’s results in 2012 would have been exceptional standing alone, but in light of the fact that he returned to competition after being absent for more than a year while recovering from a potentially career-ending injury, Jake’s results were spectacular. Among his accomplishments were a half marathon PR of 1:09:19 at the USATF Championship in Duluth, a very strong 51:58 at Army 10, and his GRC-leading finish at USATF Clubs Cross Country. Jake’s comeback is just getting started, and he is determined to continue the upward trend in 2013, when he will run a big marathon PR in Phoenix, and additional PRs at shorter distances later in the year. Beth rebounded from her injury/illness-shortened 2011 by continuing her meteoric rise to elite status. Among Beth’s many highlights in 2012 were her huge PRs of 36:11 for 10k at Pike’s Peak, 60:00 at Army 10, and 1:21:09 at the Philadelphia Half Marathon. Proving that lack of experience is not an impediment to success, Beth ran 17:52 for 5,000 meters in her first track race since middle school, and was GRC’s second woman at Clubs in her first-ever cross country race, placing an excellent 76th overall. Beth will keep rolling in 2013, when she will crush her marathon PR in Phoenix, and continue to rewrite her PRs at shorter distances. Lauren Woodall Roady Tribute from Peter Silverman on Vimeo. This video was produced by GRC teammate Peter Silverman and features an interview with Lauren from the bus ride to Kentucky for the USATF Club XC National Championships, her first ever cross country race. Those wishing to show their support for Lauren and her family are encouraged to donate to the Friends of the Great Smoky Mountains, which maintains some of Lauren's favorite running and hiking trails near her home of Knoxville, KY. The GRC racing team will wear a patch on our singlets so Lauren will always be with us as we compete and so we are reminded of her tenacity and focus. Preliminary plans for a memorial race in Washington, DC later in the year are in the works. Anyone want to run an easy 10-13 tomorrow at The Line? At 9am? I went long today so I'm trying to get something easy in, while still getting in some miles. The chance to be outside was reason enough reason to run 13.1 miles on the morning of September 19, 2012. In the hours before the start of the inaugural Navy-Air Force Half Marathon in Washington, D.C., months of relentless Mid-Atlantic heat and humidity gave way to temperatures in the mid-60s and a breeze that was barely strong enough to notice. This was not just weather. It was an invitation. This race was to be my first serious effort since an injury in April and my plan was to take it easy during the first few miles around Hains Point and then gradually ease in to my marathon pace on the back half of the course, which ran up and down the Rock Creek Parkway. Pacers’ Shannon Miller, wearing a florescent Brooks singlet and arm warmers, passed me early and ran largely by herself for the first three miles. I saw no sign of the second place woman until I hit Haines Point and turned to see teammate Lauren Woodall, wearing Georgetown Running Club blue, over my left shoulder. Woodall’s urgent cadence signaled that she meant business and my plan to run a relaxed jaunt through the capital went out the window. We picked up the pace until Woodall closed the gap with Miller, latched on to her left shoulder, and settled into a group of seven runners (with me and a Capital Area Runner setting the pace). The race was on. The paths that lead Miller and Woodall to this race could not have been more different. Miller ran four years of track and cross country at a major Division I program and boasted personal records of 16:55 and 34:10 in the 5K and 10K, respectively. 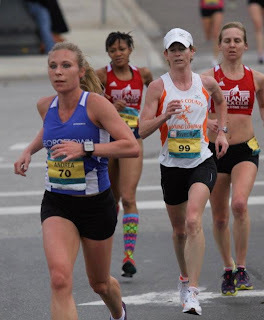 And her successes continued after college, most notably with a 16th place finish at the Boston Marathon and a 2:45:20 (faster than the 2012 Olympic Trials Standard) at the Jacksonville Bank Marathon. Woodall, on the other hand, had been a recreational runner for most of her life and was thrilled to simply qualify for Boston, which she did on her first attempt (3:27:54 in the 2010 Marine Corps Marathon). As of the morning of September 19, 2012, Woodall’s 5k PR was 18:55, a record that she nearly broke en route to catch Miller at the five kilometer mark at the southern tip of Hains Point. But the Lauren Woodall who had just re-established contact with the leader had come a long way in two years. Her marathon times steadily and significantly improved and she began training with the GRC after a chance conversation with Coach Jerry Alexander one night at a local track. She had been doing long repeats and grueling tempo runs and was looking to show her metal. As we passed the Lincoln Memorial and the sixth mile, the pack dissolved to me, Woodall, and Miller. Fearful of interfering in a two-way race for first– and feeling a little self-conscious – I picked up the pace and watched the duel unfold thirty meters behind me. As she charged north up the Rock Creek Parkway, Woodall checked her Garmin with a frequency that seemed to question its accuracy – she was clicking off 6:15 miles, a pace that, in the not-so-distant past, she was able to sustain for only five kilometers. As the runners approached the Massachusetts Avenue Bridge near mile eight, there was a palpable sense among spectators that something special was in the works. A number of fans, who were greeting Miller and Woodall with cheers of “first women!” as they continued north on the Rock Creek Parkway, had crossed over the median to see the runners heading south after the turnaround. The race had become a dogfight, with Miller surging and Woodall covering and neither runner allowing herself to be gapped. The contest was neck-and-neck until the twelfth mile, when Woodall briefly slingshotted to the lead during a hairpin turn on Arlington Memorial Bridge. Miller recovered and re-established contact by the time the athletes passed GRC runner Charlie Ban, who was photographing and covering the race for RunWashington, on Independence Avenue. With 600 meters to go, and onlookers shouting encouragement, Woodall and Miller broke into an all out, unrestrained kick. From his vantage point on Independence Avenue, Peter Roady, whom Woodall would marry only three weeks later, looked on with an expression of shock and unmitigated pride and called out “Come on, Lauren, you got it!” The women were giving it all they had. Woodall was squinting her eyes and her left arm was whipping farther across her torso than usual. Miller’s graceful gait looked like it might break down at any second. I crossed the finish line and immediately turned around to watch the runners as they careened to within steps of the tape. No serious runner would miss a photo finish in a half marathon, especially one contested by a teammate. But I was especially invested in this outcome because Lauren’s journey to competitive distance running had so closely paralleled my own. Neither Lauren nor I had anything that resembled an impressive running pedigree. Although lifelong runners, we never ran in college and spent three years in our mid-20s focused on law school, running on treadmills occasionally for fitness. We moved to Washington to work as attorneys, a line of work that did not lend itself to serious training. The lure of the marathon inspired us to begin training seriously and a gradual improvement at that distance - Lauren’s more significant than mine -- provoked us to independently undertake the same experiment: to see if we could hang with post-collegiate runners whose accomplishments and athleticism far exceeded our own and in the process come as close to reaching our potential as our professional responsibilities would allow. By any right, neither Lauren nor I were in the same class as most of the GRC runners (a fact of which, despite the club’s complete lack of condescension, we were acutely aware). But the club and coach welcomed us and provided a training environment that yielded results that were far more successful than anything we could have accomplished on our own. As the finish line approached, it had become clear that Woodall’s experiment with elite-level competition was an unqualified success. The sight of Lauren shoulder-to-shoulder with an elite athlete in the finishing stretch of a major half marathon validated my aspirations and helped to quell any doubts about whether I was wasting too much time and energy on a sport that would never pay the bills. But this is not a feel good story about an underdog who gave it her best shot and went home with the satisfaction of a job well done. To Lauren Woodall, this was a street fight aimed at achieving nothing less than the top spot of the podium. Woodall ran herself past her old point of exhaustion, but Miller’s vicious kick, let loose during a final sprint down 15th Street, was too much to overcome. Miller won the race in 1:21:40, one second faster than Woodall. Neither woman rested on her laurels and both went on to have stellar fall seasons. In November, Miller finished the Richmond Marathon in 2:53. Woodall continued her improvement, setting PRs in the 5K (17:53) and the 10K (36:35). The heartbreaking tragedy that unfolded in Lexington, Kentucky on the evening of December 8, 2012 stood in stark contrast to Woodall’s triumphant performance at Club Cross Country Nationals earlier that afternoon, in which, although missing a scoring spot, she went so deep that she could not stand unassisted after the race. Her parents, who had driven from Tennessee, were on hand to see their daughter’s bravery. Despite the ferocity of the competition, Miller, gracious in victory, congratulated Woodall on a breakthrough performance after the two crossed the finish line. I found Lauren in the shoot and my attempt at congratulations was cut short when, still gasping, she lamented not kicking earlier. But she eventually admitted that she was thrilled with her performance and headed toward the Washington Monument to join Peter. It is with heavy hearts that we mourn the death of our teammate, Lauren Woodall Roady. She was struck by a fire truck that was not on call Saturday night in Lexington, KY, which police say killed her instantly. Earlier that afternoon, Lauren had competed for the Georgetown Running Club in the the USATF Club Cross Country National Championships. Lauren was new to the sport of running and she showed amazing talent and promise, on top of an enthusiastic and engaging personality. While training with us for the last nine months, she lowered virtually all of her personal records dramatically, nearly every time she raced. Nobody worked harder or trained smarter than Lauren. But moreover, her enthusiasm for the sport she had so recently embraced and her quiet, but strong presence inspired the whole women's team to push a little harder in every workout. Her fresh approach and constant improvement embodied the joy of training and racing. Lauren's steady, inspiring, and cheerful presence will forever be missed. Our team also extends our condolences and thoughts to Lauren's husband of two months, Peter, and her family. The team will organize a trip to celebrate her life this Saturday with her family and friends with a two-mile run, followed by a memorial service. GRC Women record an historic GRC-best 11th place team finish. On the men's side, the A team finished 17th in a highly competitive field, while the B team finished 39th. 265. Charlie Ban, 30, 35:24. A year ago, Karl and I were running down the W&OD trail, west of Vienna, in the dark. There I was, crying like an idiot, because a) I was terrified of a skunk ape Karl said was just off the trail, and b) I was sad that the whole team couldn't join us on our impending trip to Seattle for the USATF Club Cross Country Championships. Fear not, he said, next year is going to be great. He had a point. The race would be back in Lexington, Ky. in 2012, driving distance from Washington, and we had a whole year to get people on board and show the running world what kind of team we had. Not one that was maintained by a fancy sponsorship that keeps people coming back so they can get stuff, but a group that trains together because they want to be together. Because we're better as a result of the group's commitment. Colin "Noodles" Raunig typified the GRC experience last Saturday during cross country practice at the cell phone tower field as he talked to an aging stoner who was walking his dog and marveling at the packs of running sprinting about..
"I was running on my own and was doing alright, but after a few months with these guys I'm running the best times of my life," he said. We've lost some people along the way to injuries, babies, school, but the group on the trip has gotten a boost up the steps to the bus from everyone else who has hit the track at B-CC this year, whether they been paced in workouts, pushed in races or received moral support from their teammates who will be there only in spirit. For many runners, committing to the club cross country race has meant deferring plans for fall marathons, in so demonstrating the highest commitment to the team goal. "It's been great for everybody to have a shared goal and a common focus," Coach Jerry Alexander said. "At this level, it's very rare to have an opportunity for meaningful team competition against teams that are our peers, and we all value the chance to see how we stack up. 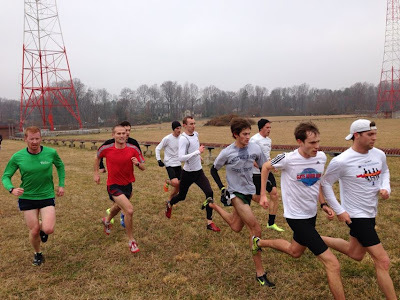 One of the most difficult aspects of post-collegiate running is that the athletes set their own goals, such that teammates are often training for different events and peaking at different times. For all of us to know for the last six months that our collective priority was clubs has allowed us to work together in a way that was both unusual and enjoyable." The men's and women's teams will be battling for top 10 finishes, a goal Alexander said is a realistic, if ambitious, target, but commensurate with the level of talent and commitment on the teams. A second men's team will throttle other clubs with GRC's depth. "We've prepared the best that we can, and all systems are go right now," Alexander said. "We're focused on going out there on Saturday and executing our race plan, and if we can do that, it will be mission accomplished, no matter what the score sheet says." Teal Connor- A marathon veteran who is getting reintroduced to cross country, having not run it since high school, she's ready to step into the unknown before returning to her optimal distance. Beth Young- A true force of enthusiasm behind the clubs effort, despite being unfamiliar with cross country and having just bought spikes recently. The women's team has excelled at pack running this fall and Coach Jerry sees that paying off on Saturday. "There is strength in numbers, and if our women can work together and pull each other through the difficult middle stages of the race, we'll be in very good position when the kicking starts with 1k to go," he said.